Finding the best approach to investing isn't a matter of right and wrong. It's a matter of finding the right one...for you. Boiling down most personal finance to the bare essentials generally leaves us with some variation of the following: Spend less than you earn. Build up an emergency savings fund. Invest the difference. While there are plenty of different strategies and tactics suggested to best accomplish all this, that is the primary arc most personal finance advice takes. However, once Americans get their basic finances in check by getting their spending under control, establishing a budget, and saving, the question immediately arises: What is the best way to invest the savings? As it turns out, there are several different paths to take while investing in the stock market, and none are necessarily right or wrong. Rather, most of these approaches have to do with finding what works best for each individual. All of us have different personalities, different goals, different interests, and different appetites for risk, and knowing where we fall within this matrix of options will probably go a long way toward determining which approach we choose to take. With that in mind, let's look at the many different approaches we have to investing our hard-earned money in the stock market. There are many different approaches to investing, but ensuring you are spending less than you earn and investing the difference is the most important thing to get right if you want to build long-term wealth. Image source: Getty Images. Before tackling the different path we can take to invest, though, let's discuss the one crucial factor that should remain consistent across all investment approaches: a long time horizon. If you don't have five years before you might need your money, that's fine, just consider other vehicles -- such as savings accounts, CDs, or bonds -- as better ways to park your cash with that time frame in mind. Invest money you plan on keeping in the market for at least five years. (We recommend a lifetime.) Stocks can and will go down. Sometimes a lot. And sometimes the market will take years to recover and reach new highs. But the long-term prognosis is tremendous. ...Holding periods of ten years resulted in positive returns 88 percent of the time. For twenty- and thirty-year holding periods, that number jumps to 100 percent. When investing for long periods of time, investors have the winds of fortune at their back. When investing in the stock market and hoping for gains over much shorter periods, they are at the mercy of the market's inevitable whims and fits. That's a sucker's game, one that Wall Street research firms and boutique hedge funds have dedicated billions of dollars to winning. The one advantage individual investors have is taking a long view of investments and letting compound interest do the heavy lifting. With that in mind, something the Motley Fool does not endorse is day or swing trading. This approach leads to stocks being bought and sold for extremely short amounts of time. For day traders, holding a position could be a matter of mere seconds. Swing traders generally hold onto stocks for a period of a few days or weeks. Traders often rely on technical analysis, a reading of stock price chart patterns, to determine when to initiate and exit positions. With this type of analysis, little thought is given to the business operations and financial health of the company whose shares are being bought; instead, technical analysts only hope the stock's price follows a certain pattern after it's bought. The fundamental divide in approaches to investing is between passive investors and active investors. Passive investors prefer a hands-off approach, preferring to regularly put money into index funds or ETFs (exchange-traded funds), both of which are designed to imitate the performance of an applicable benchmark by purchasing all of the stocks contained within that benchmark. Active investors, as the terminology indicates, take a more active approach to their investments, meaning they aim to accomplish a specific goal, usually beating an index, through the careful selection of equities in their portfolio. This can be accomplished either through acquiring individual stocks, bonds or a collection of mutual funds run by active managers. There are both pros and cons associated with passive and active investing strategies, and while I take an active approach to my own portfolio, it might surprise you to learn that I believe a passive strategy is right for a good number of people. Here's why. There are many right reasons to take a passive investing approach to your own portfolio and one, oft-cited, wrong reason to do so. For starters, not everyone has the interest to learn the necessary steps or gain control of the tools to take an active approach. If managing your portfolio's money sounds like a cumbersome chore full of dreary hard work, then passive investing is for you. Similarly, if you don't have time to do a little homework at nights or on the weekends passive investing offers an approach requiring minimal time and effort. There are many wonderful benefits to passive investing, namely that investors can participate in the stock market for a low fee and minimal time commitment. These advantages make this an ideal approach for a great many people. One wrong reason to passively invest, though, is the belief that it's impossible to "beat the market." Unfortunately, this has become a common mantra among financial advisors and personal finance bloggers: It's impossible to beat the market, so don't even try. Many who espouse this theory often cite the efficient market hypothesis, a theory that suggests all pertinent information about a company's stock is known and reflected in the share price at all times, meaning stocks are always fairly valued. The implication being that beating the market is a game of chance, not a matter of careful study and analysis of the companies selected for your portfolio. Despite the theory's popularity, it doesn't take much reflection to see its shortcomings. For starters, how does it reflect stock market bubbles? On October 19, 1987, for instance, the Dow Jones Industrial Average lost 508 points, a staggering 23% in one day. Were stocks listed in the Dow priced fairly at the beginning or the end of the day? Others maintain that while stocks might not always be fairly priced, it is simply too hard to consistently pick winners that allow individual investors to beat the market in the long run. Again, this logic falls short. Warren Buffett has crushed the market's returns over a lifetime of investing by sticking to the principles of value investing. I would be remiss if I didn't point out that The Motley Fool offers a number of investment newsletters with different strategies that have beaten the market since their inception. For those with the time and desire to take a more hands-on role in their financial well-being, an active approach might be just what they need to juice their portfolio's returns. Active investors engage in fundamental analysis, an effort to study the business behind the ticker symbol (an arrangement of letters or numbers that represent a company listed on an exchange) to gauge how much the business is worth. Successful active investors use metrics such as revenue and earnings per share growth and the price-to-earnings ratio to help make these determinations. Beyond quantitative factors, investors also use qualitative analysis, like determining if a company has an economic moat, one or more competitive advantages that can keep competition at bay and protect long-term profitability. Of course, while these are all tools in the active investor's tool belt, there are still many different strategies and tactics active investors use to obtain market-beating returns. Let's take a closer look at the most commonly employed approaches. In general, income investors prioritize the income generated by their portfolio's holdings over their price appreciation. While some income investors might be content to hold safer investments such as CDs and bonds (in an effort to preserve capital over creating wealth), active income investors turn to owning stocks that pay dividends. When you purchase a stock, you become a partial owner of a company. A dividend is simply money the company has decided to pay out to its owners. This is usually done on a quarterly basis, but companies can decide to do it according to any schedule they choose. There are several reasons for investors to take this approach. For starters, many investors need the returns their assets generate for living expenses. By using dividend payments, investors can hold on to quality holdings without having to worry about selling shares to fund themselves. Other reasons investors might prefer companies with a history of paying rising dividends include: 1) It enforces financial discipline on a company's management; 2) it's a strong indicator of what management is thinking, regardless of what it is saying; and 3) it is a reward for the risk shareholders take by buying shares in a company. A common tactic for dividend-loving investors is to invest in Dividend Aristocrats. Dividend Aristocrats are stocks in the S&P 500 index that have raised their dividend at least once a year for the past 25 consecutive years. Many believe this track record, though not necessarily indicative of future returns, indicates a strong and healthy business model, with a proven track record of surviving economic downturns. This illustrious group includes blue-chip stalwarts like Coca-Cola Co, Johnson & Johnson, and McDonald's Corporation. Needless to say, investors in such stocks generally sleep well at night and are not afraid that half of their net worth is going to disappear in the next stock market crash. One common mistake novice income investors make is the practice of sorting and buying stocks with the highest dividend yields. This type of search often produces results containing stocks with ridiculously high dividend yields of 10% and more. While these stocks might look tempting at first glance, high yields like these are often produced by precipitous declines in the stock's price, which, in turn, are usually a result of a company's poor performance. In some shape or form, this usually affects the company's earnings power. If this is the case, these high yields are often followed by a dividend cut or the elimination of a dividend payment altogether. This year, General Electric Company shareholders faced a sharp dividend cut after the company's stock price fell, which briefly created what appeared to be a very high yield. To avoid this trap, investors should always examine the payout ratio of a stock's dividend yield. The payout ratio is a simple formula that divides the dividends per share by the earnings per share. The lower the ratio, the more sustainable the company's dividend is. When a payout ratio, expressed as a percentage, is over 100%, this means the dividend can only be paid when the company either dips into cash on the balance sheet (when available) or takes out debt to make the payment. This is unsustainable. Personally, I do not like to invest in stocks with a payout ratio over 75%, though there are other crucial variable factors to consider such as projected earnings growth. This graph shows the essence of value investing: Buying a stock with a high margin of safety. In other words, buying when it is priced well below its intrinsic value. Graph by Daniel Sparks. Used with permission. Value investors have several different metrics at their disposal to determine a stock's intrinsic value. Probably the most commonly cited and used metric for value investors is the price-to-earnings ratio. The P/E ratio is a formula that divides a company's stock price by its earnings per share. The lower the ratio, the more bang investors get for their buck. Value investors also like to use the price-to-book ratio to determine if a stock is under- or over-valued n comparison to the sum of the companies assets. When this ratio is less than one, it signifies the stock is trading for less than the value of its assets. Many of the world's all-time greatest investors, like Benjamin Graham and Warren Buffett, built their fortunes on the principles of value investing. Value traps are stocks that appear to be cheap based on certain metrics, like a P/E ratio, but in reality are not because of declining business prospects. While a low P/E ratio can indicate a relative bargain, it can also point to a company that analysts believe will demonstrate lower earnings in the quarters ahead. After stumbling upon a stock with an unusually low P/E, investors should complete additional research to make sure its earnings are not expected to decline significantly in the near future. Growth stock investors are not worried about the income their stocks generate, or even their current valuations. The most important factor for growth investors is that their stocks have a long runway of growth ahead. The greater the growth, the better. While growth stocks often appear expensive based on traditional metrics like the P/E ratio, growth investors believe these companies will grow earnings so rapidly that they are actually much cheaper than they appear. Some high-fliers do not even produce earnings, preferring instead to reinvest all money back into the business to grow it even faster. For companies such as these, other metrics might work best, like the price-to-sales ratio, which is calculated by dividing the company's market cap by its annual revenue. 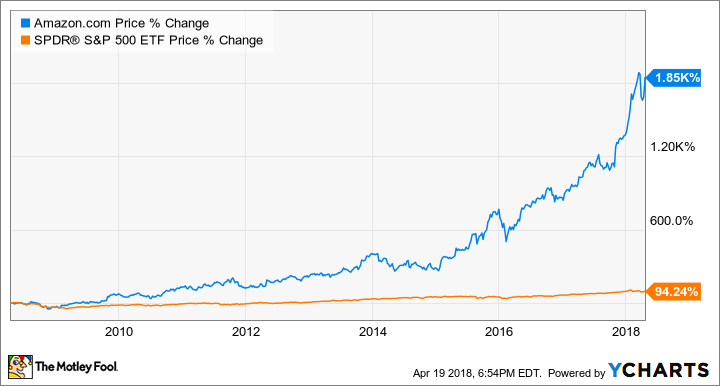 This metric, for instance, is a much a better way to value companies like Amazon.com, one of the most phenomenal stocks of the past two decades. Amazon has never demonstrated consistent earnings growth because it is constantly shoveling money back into the business to fuel future growth. Despite this lack of earnings growth, Amazon's stock price has skyrocketed (with some big falls along the way) because its revenue keeps marching higher. Other useful metrics for valuing growth stocks include the forward P/E ratio and the PEG (price-to-earnings-growth) ratio. The forward P/E ratio is calculated the same as the P/E ratio with one exception: Simply substitute the trailing-12-months' earnings with projections for the company's next year earnings. The PEG ratio takes the P/E ratio and divides it by the expected earnings growth rate of the company. In other words, it is ideal for determining the value of a company relative to its growth rate. Both are useful tools for growth investors. The biggest risk for growth investors is to realize that when growth stocks earn sky-high valuations based on heady earnings estimates, the stock prices can take huge tumbles when those rosy estimates do not materialize. While these dips sometimes present investors with great buying opportunities, they can also represent a broken thesis for an investment. This can be the case for biotechs that developed a major drug that failed to get approval from the FDA, or a tech company's advantage that was commoditized away. Because of the increased volatility of growth stocks, discerning growth investors must know the difference. It's important for investors to know themselves before picking a strategy. If you do not believe you can handle the sometimes stomach-churning volatility of growth stocks, a portfolio of tried-and-true Dividend Aristocrats might make sense. If you believe you would grow bored watching dividend payments drip into your account and would be too tempted to overtrade, growth investing might represent the best way forward. If you have no desire to learn anything else about investing ever, then passive investing is a great approach to capture the market's upside without having to worry about the details. Whichever approach you choose to invest with, the most important thing to take away from this article is this: Spend less than you earn. Build up an emergency savings account. Invest the difference.